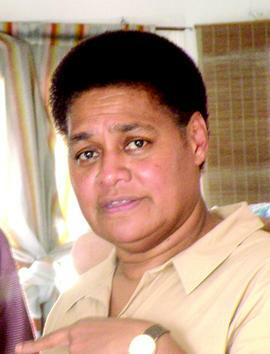 If you had asked me if I knew the late Fijian Laisa Taga of the Island Business International I would say “yes”. Although it may seem strange if I told you that I never met her in person. Last year Eva Arni, head of PR and marketing for Air Niugini, Papua New Guinea suggested that I contact Laisa about writing some stories for the Paradise In-flight Magazine. When I wrote to Laisa some six months ago, she immediately wrote back with enthusiasm. After discussing the general understanding of what types of articles to write and the expectations between a writer and an editor were established, we warmed to each other with bits of Fijian words thrown into the conversations. Not long after that, Laisa published my first article on the Kula Trade in the Paradise. I have posted a copy of that article in this blog. I was thrilled. Most of what I had written in the Kula story had been kept meaning Laisa must have liked what I had written. It was true she liked what I wrote because she hounded me after that first story for more. I had promised Laisa two articles. One on weaving and the other on the Miss South Pacific Quest and the events that unfolded that crowning night. When I told Laisa I was not feeling very well and would need to send her the articles later to go into the next edition, she accepted graciously and said she would wait. She told me “your health is very important” and I should take care of that first. Tonight as I read an email from Godfrey Scoullar – Publisher & Managing Director Laisa’s colleague, about Laisa’s passing and that she insisted she needed to work until she could work no more I could only cry. Not once did this woman show and make me feel in any way, that she herself was facing the greatest challenge of her life (cancer) which would in the end, take her life. My insides were ripped. Isn’t it amazing how we take life for granted? And how precious is time? I had only written to Laisa two weeks ago wondering if she had received my copies. It was unusual for her to take so long to reply. I had taken it for granted that I missed the deadline and I should just wait for her to write back. And tonight, when I went over our email and how lazy I had become in paying so much attention to other things and not submitting these articles sooner, I feel absolutely hopeless and angry at myself. Jason from A Good Blog is Hard to Find (blog) once asked the question – could you really know someone virtually even though you might have never met them. My answer was “yes” and my answer tonight is “yes”, I do know Laisa. I am so grateful to have known her and especially in her last weeks. Laisa Taga had used her last precious time to continue her work with people like me – to bring stories for enjoyment to thousands of readers like you all over the world. I hope that I had given her something very small in return by what I had written for her editorials. Farewell Laisa. The angels will rejoice at your glorious spirit that you have shared with us. Below was the last I heard from her. Just checking on those two stories promised. I am now working on the next issue of Paradise – collating pieces. Islands Business International is touched and comforted by the outpouring of grief and sympathy on the passing of our Group Editor in Chief Laisa Taga who died peacefully surrounded by her close family members at her Suva home on Friday morning. Quietly and determinedly, Laisa had been battling cancer for some time. It was her wish she should continue to work until she could work no more. Her family will announce funeral arrangements once they are finalised. On behalf of Islands Business International, its staff, clients and its many friends in Fiji, in the Pacific and around the world, I wish to thank you most sincerely for the expressions of sympathy and sorrow on Laisa’s passing. Laisa was a tower of strength, a hard working and knowledgeable editor with a measured temperament and great sense of humour. As a regional media figure she was a quiet achiever who downplayed her achievements and never sought recognition. She has left a vacuum that would be difficult to fill. May Laisa rest in peace. It was my sister’s birthday today. It was also April Fool’s day. I celebrated Vagi’s birthday because she turned 34. And, I also celebrated her because she recently became a mum of a beautiful son (just over a year old) and Vagi has made one of the toughest decisions of her life. Only in the last week, she has decided to return home to Wagang, Lae, Papua New Guinea, after over 2.5 decades of living in the capital city, Port Moresby. My mother, brother and I celebrated her home-coming. My family on our land in Bowali, Wagang Village and me at the other end of the telephone in Brisbane Australia all talking and laughing and just being happy. I was pleased because being in the big city has become so expensive. Port Moresby was also one of the scariest place to live in. Vagi’s partner was not always with her, him being part of a ship crew, Vagi would have to raise their son Ratu single-handed in a dangerous, expensive and stressful place. Everyone in the family were thrilled when we spoke after their arrival in Lae on Saturday. Today, Vagi called. I answered my mobile in Brisbane and wished her a “Happy Birthday”. Vagi broke down and cried and I became afraid. I had no idea what had happened but I had to wait for her to finish crying to tell me her toddler was very ill and had been admitted to the hospital. I was shocked. I had only listened to the little man’s gurgles last night. I truly felt her despair. Everyone in our family knows the status of health services in Angau and other PNG hospitals. They are mostly ‘dead ends’. Angau, the public hospital in Lae has been deteriorating for so many years. Coupled with termites having been through the whole facility, the building and service has not been at its full capacity for a very long time for the second largest province in PNG. This issue of lack of proper health services and a good hospital has been a major set back for the people of Morobe Province, especially Lae City. I can imagined why my sister would be so upset. She did not have a lot of choices and it was daunting to go somewhere you think you could trust, but you really can’t. Personally, I have watched in the emergency ward and other wards in Angau as many family and loved ones died due to no proper care nor basic equipment and medication. I am sure many others have gone through the same heart-breaking experience. I was alarmed at my sister’s phone call. She assured me that they were in one of the private hospitals which was costing about $AUD300 per night. Not that my sister had such money, hence, the phone call. But even I did not have money to keep up with the such nightly expense. The panic in Vagi’s voice said it all. It is the same panic many have when they go to Angau. Our people always made a joke that you need to make sure your health is in top shape because when you head to that hospital, you might as well be dead. Many people are afraid to be sick. When my grandmother had her stroke a few years ago, we were told by private doctors that her lungs had already been flooded with fluid and there was nothing anyone could do. Everyone waited for her to die. After we could not get better assistance, we were directed to Angau and we spent a day waiting for a bed to become available. There was a tug-o-war over the bed between myself and the ambulance assistant that wanted to take the bed back to the private clinic. They were preparing to place my grandmother on the cold dirty and bloody concrete floor until a bed became available, who knew when. I begged the assistance until they got sick of me and they left the bed with my grandma on it. Throughout the evening in the emergency ward, I helped to answer the phone calls which were going every second and every hand in that ward were busy. I was told by one of the staff that there were five female HEOs (Health Extension Officers), no doctors except one working across the whole hospital. As I watched, several people were admitted into the emergency ward and all were placed on the floor because there were no beds. It was a daunting experience. And just for a background story, a few years before that, I had through Soroptimist Brisbane (South East QLD) organised 100 beds donated to be donated Angau Hospital. These were shipped from Brisbane to Lae through Lions Club. I was told these beds were used in the wards the hospital needed particular emergency beds which they could not afford. The hospital needed so much more in other areas such as skilled doctors and nurses, medicine and equipment. I would really like to challenge the affluent, leaders and those in the know to please go to Angau and other public hospitals and take a look around. Spend a day in the emergency ward. I bet you may never want to be rushed into that emergency ward yourself. You would rather take a medivac (medical evacuation) to Cairns or Brisbane or even fly to Singapore for your emergency.